JR: Today Jungle Red Writers welcome debut novelist Jeri Westerson. VEIL OF LIES was published this month by St. Martin's Minotaur, which Publisher's Weekly called a "promising debut...an entertaining read that makes the prospect of sequels welcome." Welcome Jeri, that's certainly a great start! What made you decide to write medieval mysteries? JERI: I was writing historical fiction with no thought of writing mysteries at all. But the historical fiction market is a tight one, and after about a decade of no takers, a former agent suggested I write a medieval mystery as opposed to a straight historical, as mystery was a far better market. I had no idea how to write a mystery and I wasn't thrilled about the prospect of trying it. But after more years of rejection I decided I'd better give it a go! JR: You call this novel a medieval noir. Tell us what the heck that is! JERI: I loved the Brother Cadfael mysteries by Ellis Peters. She created the medieval mystery genre with her medieval monk sleuth. But when I sat down to think about the kind of medieval mystery I wanted to write, I knew it wasn't going to be the Brother Cadfael type. Besides history, I also had a love for the hard-boiled detective fiction of the '30s and '40s; Dashiell Hammett and Sam Spade, Raymond Chandler and Philip Marlowe, Ross MacDonald and Lew Archer. And I began to wonder if I couldn't create a hard-boiled detective in a medieval setting. And then take it down a notch into noir territory; make it grittier and edgier. That's when "Medieval Noir" was born. This was something I was dying to write! JR: So fill us in on your detective. JERI: He's a disgraced knight turned detective on the mean streets of 14th century London. He's down on his luck. Exiled from court and from the life he's known, left with nothing but his wits, he was forced to find his way and reinvent himself as the Tracker—the medieval equivalent of a private eye. He hates that he must live with the lowly of society and though it isn't likely, he lives for the chance to get his own back. In the meantime, he feels that continuing to follow his knightly code—righting wrongs and bringing criminals to justice—will somehow be recompense for his many sins. JR: As a writer of historical mystery, how do you approach research? JERI: Very carefully. I have a lot of research in my back pocket after years of writing historical fiction, but I still must rely on text books and archives. I spend a lot of time at my local university library, and what I can't find there I scour the internet, making connections with folks who run archives in England. They have been most generous to me, copying papers and maps and sending them to me free of charge. They have truly been the best resource. I'm also planning a research trip to England next year. Though the London I write about doesn't exist anymore, there are still some places I need to see again up close and personal—like Westminster Hall and Westminster Abbey as well as Canterbury Cathedral. JR: We love nothing better than a debut novelist! Tell us a little about your path to publication. JERI: That's a fourteen year-long story! I am the poster child for persistence. After I retired from a career in graphic design, I decided to turn a long-time hobby of writing fiction into a new career. I researched the industry and learned a lot of what I needed to know to get started and get published. What I didn't realize was how long it was going to take. There were many times when I wanted to hang it up, but my husband kept encouraging me, telling me that this is what I was meant to do. So while I worked for that contract, I became a freelance reporter for my local newspapers—a daily and a few weeklies—and at least got a little vindication that someone was willing to pay me for my writing. When I switched gears from straight historical fiction to historical mystery, a vast world of opportunity opened up. For one, there are numerous small presses who specialize in mystery. Likewise, there are independent bookstores all over the world that only carry mysteries. There are fan conventions, panels—all sorts of opportunities not given to other authors. I was hooked! Organizations like Sisters in Crime really helped me get a leg up. I wasn't always able to make it to my chapter in L.A. as I live quite far away, but I found a great home online with both the Guppies chapter (the Great UnPublished) and the Sisters yahoo list. Not just encouragement, which is sorely needed after so many years of rejection, but also good information you can take to the bank. If you want to write mysteries, join Sisters in Crime! Anyway, after I had the first Crispin Guest novel written, I shopped it to a few agents. But once I finish one novel, I just dive into the next. It was particularly important for me to do that with the mystery because I had never written series fiction before and I wanted to see that I could do it. I found I could, and I discovered the added benefit of really enjoying revisiting these characters in new situations. The first Crispin novel went the rounds. I also went through three agents and I was now on my fourth. After it was rejected everywhere—including St. Martin's—my agent and I concluded that this one had to be put to bed. From conversations on the SinC list, I knew that other authors didn't always get the first in the series published, so I wrote the second one with the thought that it might become the first. And then, eighteen months after St. Martin's rejected that first one, that same editor called my agent and asked if I hadn't written another novel in the series since he "couldn't get those characters out of his head." 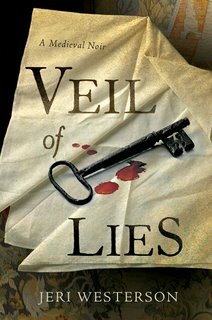 I had only just sent VEIL OF LIES to my agent. He whisked it into an envelope, and in two weeks, we had a contract. And it only took fourteen years and two weeks! Prologue or no prologue? Definitely no prologue. I trained to be a Ninja. I was fired from the Boy Scouts of America. I won the Reese's Peanut Butter Cup Cup when I was twelve for eating the most peanut butter cups at a fair. I buried my Barbies in the backyard when I was a kid and created an archaeological dig to exhume them. Oh Jeri, it's got to be the Barbies! But now the floor is open for comments and questions. Welcome to Jungle Red. I love medieval stuff (I have a suit of armour in my front hall)and your series sounds fascinating.I like that it's gritty and not romanticized and can't wait to see how a tracker does his job! Jeri, wow. Your editor story is just spine-chilling. Who do you see as Crispin? Thank you, too, to all the commenters who had such invigorating things to say. I love writers. The Red Sox mystery was a labor of love--love for the Sox and love for my soulmate, Jere. Mother and son will be at Kate's Mystery Books, Friday night, Dec. 5th. I hope you're all there so I can give you big hugs and buy all your books. I also think the Barbies. I can see you doing that, Jeri! Your book sounds great! It's been a while since I've read a medieval mystery so you've whetted my appetite once more. I think you burned the Barbies...that's what they deserve afterall! Great interview! And inspiring for this crime fictionista. I'll have to check out Sisters in Crime -- I forgot they existed. Also, I do have a question for Jeri. Hi Jeri, you mentioned going through many agents. I personally would love to hear more about that trial (do you have a blog?) because dealing with agents, know what to do with them, about them, is tough for newbies like me. My particular question: Did your various agents all try to shop the same novel? Get a new agent to shop the novel around again or forget about this novel for now because many of the likely editors already rejected it? Look forward to reading your novel! Congrats on your book pub. You mustn't ever forget about Sisters in Crime! I do have a blog, called "Getting Medieval-"-www.jeriwesterson.typepad.com --and Crispin has his own blog at www.CrispinGuest.com. I don't do much talking about my own publishing experiences on my blog. I think there are plenty of blogs out there that cover that. My blog is more like a magazine of history and mystery. But as for your question about more than one agent shopping the same novel, usually they didn't. Although the third was beginning to shop the first Crispin, but we deemed her so incompetent that my current agent just went ahead and and shopped it, too. Small publishers may not be worth an agent's time, but it is certainly worth your time. And you might need to re-evaluate that agent in any case. An agent should be more interested in career-building than that check at the end of the day. That is one of the reasons I love my current agent. He is far more interested in the whole career than those modest beginnings. Shoot for an agent that thinks like that. I think it would make a splendid movie! And I see Hugh Jackman as Crispin. :) Hugh! Are ya out there? Wanna make a medieval movie? Oh, yes, I'm very fond of Hugh Jackman. And yes, he'd be perfect. Hi Dianne, Hi Lisa! Welcome! Where are you? I met you briefly at RWA in SF. I'm the author of THE FIRST CUT. I live in the L.A. area. I have a nice sword collection and nothing makes me want to get them out more then some good medieval literature. Okay. Confession time. Was I a Ninja? Naw. Reeses Peanut Butter Cup Cup? No, but I could have been a contender. Boy Scouts? Nope. So you all so easily guessed, that I buried those Barbies. I actually put strings up in a grid and then recovered them. This was in the day when I wanted to be an archaelogist. Which lasted for as long as it took to realize I'd need all that math and science. But I still like old, buried things. I can satisfy that urge when scouring archives. Or getting to the bottom of my laundry hamper. Cheers, all!